Once again, I must apologize for infrequent, irregular updating. 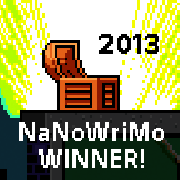 I preferred to use my time spent writing to write for Nanowrimo than my personal blog. If I’m going to form words into sentences, it might as well be for the 50,000-word behemoth, right? Yet, even neglecting blog posting has not guaranteed Nanowrimo success. I have 23,945 words written so far, leaving 26,055 to finish by next Friday at 11:59 p.m. That means over three weeks were not sufficient for me to make it halfway. Now I have one week to make up the rest and reach my goal. My biggest hurdle is to find topics to write about. It feels as if I’ve already used most of my thoughts and opinions that I wanted to say. Now I’m drawing blanks. Why is it when you focus on writing originally that, instead, all your writing comes out bland and boring? Wish me luck, and you will hear from me in a week whether I managed to think up 26,055 more words in time.